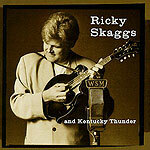 During country's brief flirtation with integrity in the mid-'80s, Ricky Skaggs rode the top of the charts. He hadn't changed from his bluegrass-tinged sound  country radio had. Although the "new traditional" wave didn't last long, it did introduce Skaggs to a wider audience than his earlier bluegrass recordings ever could have. Now released from a strict contract that prevented him from recording a single bluegrass song for over a decade, Skaggs has returned to his roots and done up an all-bluegrass album for Rounder  his old label. Good news, too: All those years of his record company trying to please the honky tonk crowd haven't dimmed Skaggs' chops a bit. He remains one of the best mandolin players around, and one of the best bluegrass singers as well. Which only shows that his years as a backing player for the Stanley Brothers and the Clinch Mountain Boys were well spent. Skaggs picks right up where he left off with his early '80s bluegrass albums for Rounder: His brand of bluegrass is a near-perfect blend of tradition and accessibility. He has a wonderful ear for melody, a good sense of drama and an amazing ability to make traditional bluegrass songs sound as modern and new as anything coming out of Nashville without sacrificing any of their substance or beauty. The backing band is just as good as Skaggs, with bluegrass stars Stuart Duncan and Jerry Douglas also sitting in on a few tracks. Of course, Skaggs is hardly the only top-rank musician performing bluegrass these days. Alison Krauss, for instance, has won a handful of Grammys for her bluegrass recordings on Rounder, and Sugar Hill Records in Durham, N.C., records nothing but bluegrass. But what Skaggs does bring to the music is a name recognition and media attention that can only benefit the entire bluegrass community. The fact that he's still one of the best there is makes it that much sweeter.